Article: Join In On All Of The Fun As Nickelodeon’s “Double Dare” Embarks On A Multi-City Tour Across The U.S. – See The Tour Dates Here! Since it first aired on TV screens back in 1986, Double Dare established itself as one of the most iconic game shows ever. It goes without saying that we’ve been glued to our TV screens ever since Double Dare returned on Nickelodeon and we’ve been loving every millisecond of all of the mind-boggling trivia, epic challenges and of course, all of the nose-picking! Well, Double Dare fans are in for a special treat as Nickelodeon announced that Double Dare will be embarking on a multi-city tour across the United States. The tour, produced in partnership with Red Tail Productions, LLC and CB Entertainment, will kick off in Fayetteville, NC, on October 30th. 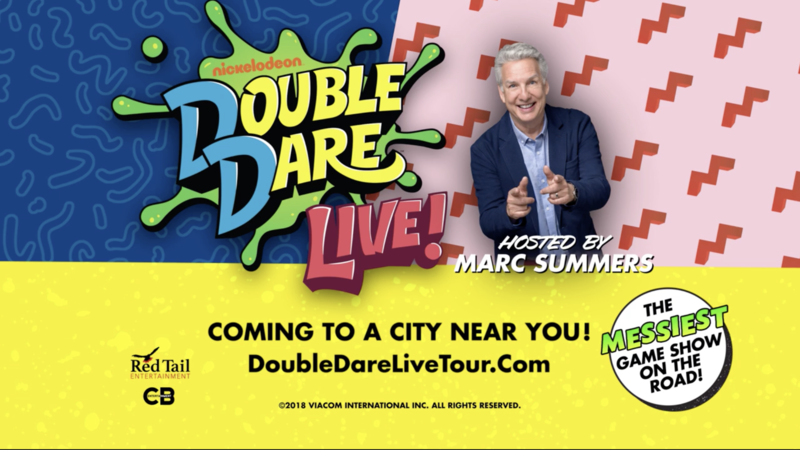 Double Dare Live will be hosted by Marc Summers, who was the show’s original host and now shares color commentary in the Double Dare reboot. He will be joined by Robin Russo on tour. Check out the list of cities and dates from the Double Dare Live tour below and be sure to get your tickets now on doubledarelivetour.com! Don’t forget to tune into new episodes of Double Dare on Nickelodeon. Check out my interview with Marc Summers at the 2018 Nickelodeon Kids’ Choice Sports below! Next VIPAccessEXCLUSIVE: “KIN” Is Captivating And Has A Perfect Blend Of Sci-Fi, Action And Adventure – Here’s A Recap Of The Movie’s Los Angeles Premiere!